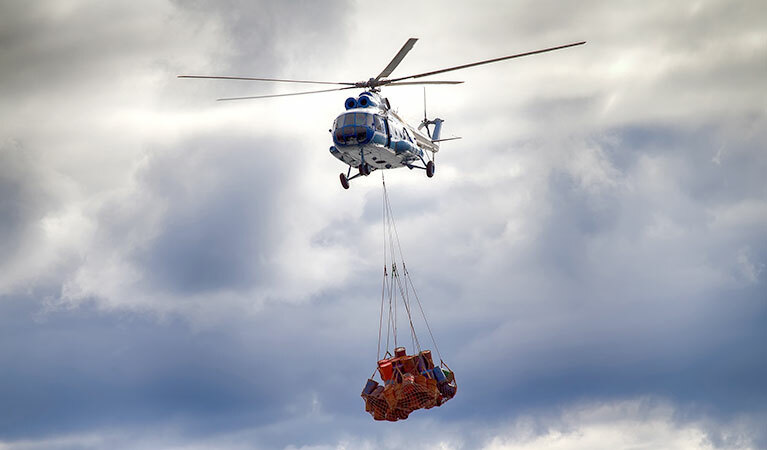 By means of our expert industry partners in Nevada, FairLifts is able to deliver access to wide-ranging helicopter services to the mining industry state-wide. The mining industry is a demanding one when it comes to logistics. Many locations are remote and isolated, making helicopters a necessity for efficient operations as well as initial explorations. In fact, they are sometimes the only means of transport in these areas. Cargo, emergency parts, supplies and equipment can all be delivered relatively quickly and efficiently by means of a helicopter, while a helicopter is vital for medevac backup in the event of injury. Mining is big business in Nevada, with gold mining contributing over $9 billion to the state’s economy and 78% to the USA’s total gold output annually. The state also unearths vast quantities of silver, dolomite, silica, copper and gemstones amongst others. Most of these operations take place in remote locations, miles from civilization. They involve continuous excavation as the minerals are harvested from the thick desert sands. Machinery, manpower and vast quantities of supplies are needed to sustain this industry. It makes sense that helicopters can assist to streamline these ongoing operations in several ways. Helicopters are instrumental in carrying out numerous services for the mining industry throughout all stages of surveying and production. Thanks to state of the art surveying and photographic equipment onboard, helicopter flights can reveal suitable sites for mining operations as well as uncover potential risks to the undertaking. By getting aerial mining assistance on board from the outset, you can save yourself time and money at every stage of your mining enterprise. Skid mount and helicopter-portable drill rigs are an important tool for mining in remote areas. It can be extremely difficult to maneuver this heavy equipment from the ground. In remote locations, helicopters have the power to lift and position these bulky machines more effectively than any other method. Geophysical surveys are far quicker and easier when carried out in an exploration helicopter. The latest helicopter-borne electromagnetic systems are designed as a direct-detection and mapping tool, that makes short work of surveying potential sites for mining operations. This kind of observation is also far safer from the air. Once mining operations have ceased in an area, helicopters can play an important role in surveying the land from the air, revealing possibilities for effective rehabilitation. They are also commonly used to spread fertilizer over the affected areas and transport seed, personnel and machinery to be used in the process. The remote location of mining operations can make transporting the necessary personnel a logistical nightmare. Helicopter personnel transport is safer and quicker than conventional transport, ensuring your workers spend their valuable time on mining instead of in transit. As a Medevac solution for personnel, helicopters have no equal. It is clear that helicopters can add enormous value to your mining operations in Nevada at every stage, regardless of the size of your enterprise. Apart from time and cost-savings, helicopter services have an excellent safety record and operate according to the highest standards of customer service. You can rest assured that you have access to the very best that the industry has to offer when you deal with FairLifts. We are associated with only the highest qualified, most experienced pilots and crew. Whether you need assistance with many tasks or only one, we can arrange a helicopter service to suit your needs.